I have always loved and appreciated fully fashioned knitwear, the style of knitted garment where none of the yarn is wasted. Each individual piece of the garment is knitted to the exact shape required. This is the way hand knitted garments are made. If a garment piece needs to be tapered, for instance, the knitter executes one of several styles of decrease. The most advanced models of industrial knitting machines also do full fashioning, increasing and decreasing where necessary, sometimes creating whole garments, seamlessly. As a person who's worked professionally as a stitch pattern designer, I never really considered the method used to reproduce my stitches and create the end product. My job was to simply come up with interesting knit stitch patterns. 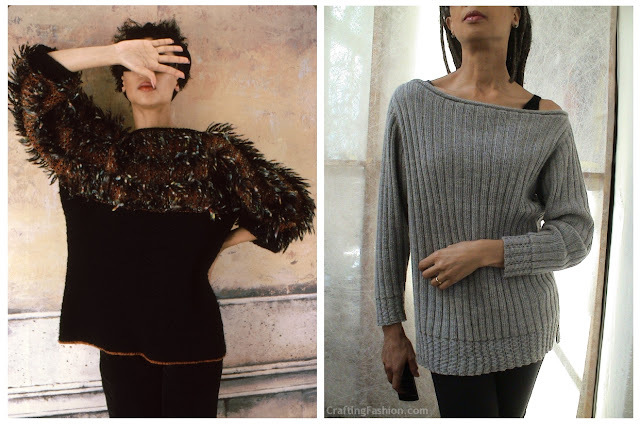 As a crafter who knits primarily on a vintage "hand knitting" machine, when I created a garment, full fashioning has been my method of choice, increasing and decreasing through the hand manipulation of stitches. My sweater on the left is from the 80s, the one on the right from last year. Fully fashioned, both are impossible to distinguish from cut and sew without close examination. Any competent sewist could make them if the fabrics were available. When I returned to machine knitting at the beginning of 2011, after an extended hiatus, I considered cut and sew seriously. But I did not go there. Instead I fell in with a bunch of hand knitters, some who quivered at the thought of a steek. The machine knitting groups that I joined on Ravelry and Yahoo Groups were much more open to cutting and sewing. (Imagined dialog: Cut our knits? No problem. We can each consume a pound of yarn before lunch anyway. We knit with machines, why not sew with machines too?) Though I cut and sewed many a neckline, I did not venture further. Then, while browsing in the fashion section of a local book store a few months ago, I came across Pattern Magic: Stretch Fabrics by Tomoko Nakamichi. Pattern Magic: Stretch Fabrics is the third title in the series of cult Japanese pattern-cutting books, now available in English. 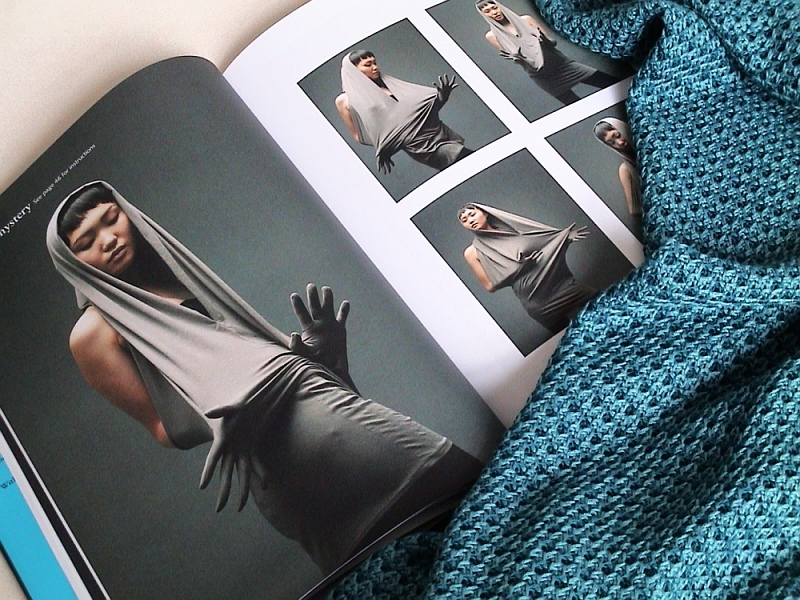 Step-by-step projects show you how to create stunning sculptural clothes, using a creative approach to pattern making. I bought it. I admit that many of the designs in this book are wilder than I would ever wear. Honestly, I may never even get around to re-creating any of the designs exactly (though I'm not ruling that out). I can only say that I was inspired. The approach and concepts in the book really got me thinking, got my creative juices flowing. And even though my fabrics are a different gauge than the ones in the book, I imagined using some of the techniques while working with my own fabrics. I probably won't be making "Pattern Mystery". I love the method of drafting "Two Peas in a Pod A" and would totally wear my version. My plan? I'm taking my knits, cutting them up and sewing them back together in new ways. I may break some rules out of ignorance or... just because. Don't worry about the waste fabric, 'cause I've got a plan for that too. I'm crafting fashion. I'm really looking forward to following your experiments! Be brave, cut away!!! I promise to be brave. :) Thanks! Congrats on Crafting Fashion! I love this! Just finished sewing a tunic for Zoe by hand and i loved the process so much I am already planning my next project! I'll be blogging about it next week. Our best to Ken and JT! Oh, thank you! I look forward to your post about the sewing project. I suspect you'll be very inspiring. Good luck in your new pursuit! I only now stumbled upon your blog and I absolutely love the concept! I think it's very original! I will follow you because I am very curious about knits and especially cut-and-sew knits. A also love these Pattern Magic books, although have not gotten to making any of the projects from them yet. Looking forward! And good luck! Just in case you need a little encouragement to make something from PMStretch, there's a group challenge sewalong that Lisa has set up and I'm sure she'll love you to get in touch. Thanks for letting me know about the sewalong, Marianna. I'll definitely check it out. I am both happy and inspired to have found your amazing blog. I watched a video of Karen Allen taken from the Martha Stewart show a couple of years ago, making machine knit-cut and sew sweaters. I was so blown away by the concept (which up until that time I had never considered) that I ran out and bought a cheap serger to go with my collection of knitting machines. I confess I have not taken the time to sit and learn these skills yet, but reading your blog has re-inspired me and given me just a little push to get on with it. Thank you so much for sharing, I love your blog! Welcome, Chantelle. And thank you for all the kind words.